One thing I never noticed about cows is how absolutely adorable they are. And thinking that, I couldn’t help thinking about something else. About how arbitrarily we categorize things. And also about the consequences of those categorizations. Dogs are pets, for example, while cows are food. Those differences are cultural, of course, which is just another way of saying that they’re what our parents and neighbors believed. And they believed what they did for no other reason than their parents and neighbors before them believed those same things. If we had been born in India, where cows are often revered, we’d see things entirely differently. If that is true then it is also true that our strongly held feelings regarding meat (among other things) are really based on nothing more than random chance. There is no law of nature dictating that we react with horror at the thought of eating Fido but be completely indifferent to the sight of Bessie on our plate. It’s simply what we’re used to. A more rational approach to our foods would have us either recoiling at eating all dead animals or at none of them. I can still remember a time, back when I was growing up, that I really enjoyed fishing. I collected lures and tied flies and jumped at the opportunity to cast a line whenever I could hitch a ride to a lake or a stream. As I grew older, I grew out of the sport for no particular reason at all. I got busy with other things. I moved to an urban environment. For one reason or another I used my old rod and reel less frequently until one day I abandoned them altogether. Many years later, as an adult, I borrowed my grandfather-in-law’s rod and spent some time casting into a pond in the back of their house. I caught one fish. My last. Reeling in that fish didn’t engender the feelings of excitement I remember feeling as a kid. All I felt was the overwhelming cruelty of the act: tempting another living creature to impale itself on a barbed hook and then hauling it by torn jaw into a suffocating environment. Struggling, gaping, gasping, twisting, turning, croaking, agonizing at the end of my line. Presumably all for my enjoyment. Never again. I’m not exactly sure what changed over the twenty-five-odd years between my last two fishing experiences. I think a heightened sense of empathy explains everything. As a kid animals were just things. As an adult I know they feel pain and fear. I know they suffer. I don’t want to be the cause of suffering. Sportsmen are quick to point out the hypocrisy of meat eaters who disdain hunting and fishing. They note that we simply sub-contract out the killing to slaughterhouses that do the dirty work and deliver meat for us to the sterility of a grocery store cooler. And they’re right in that the end is the same. Both result in a dead animal on a plate. But the means matter. 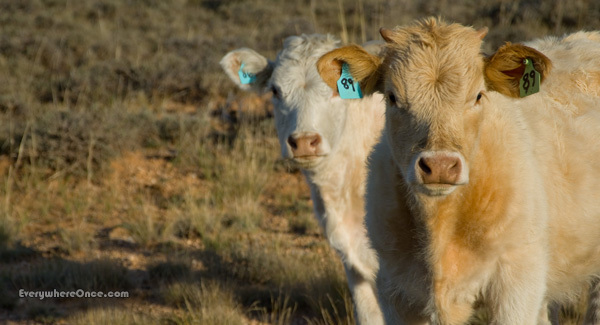 Eating meat, especially out of need, is one thing. Stalking and killing for the pure pleasure of it seems something else entirely. And the practice of mounting animal carcasses as trophies puts the lie to any notion that sportsmen are simply, or even mostly, just procuring dinner. And yet meat-eaters, a group to which Shannon and I claim membership, shouldn’t be too smug. We’re not quite so far removed from the barbarity as we’d like to believe. It’s been a very long time since any of us has really needed to kill for survival. That is important, I think. Our bodies certainly don’t need as much meat as we generally fill them with. If anything, we tend to eat more of it than is even good for us. We do so really for only one reason: because we enjoy it. 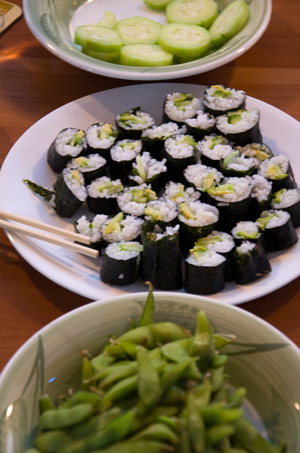 Vegetable rolls, edamame and cucumber salad with soy sauce, wasabi, and sake makes a deliciously healthy and totally filling vegan meal. Killing for pleasure and commissioning killings so we can enjoy the fruits of the killer’s labor are not exactly the same thing. They are, however, close cousins. Close enough that intelligent humans can see the relationship. But mostly we don’t see. We go out of our way not to see. Instead we’ve constructed an environment where picking up a cellophane-wrapped steak feels no different than buying a head of lettuce. Both are just things on a shelf. And we have no empathy for things. That is what those big brown eyes said to me, anyway. These words are not written in judgment of anyone, unless mostly of ourselves. We still eat meat and expect we’ll continue to do so. But we are eating far less than we once did. Over the years we’ve tried to make healthier choices and that has gradually moved us away from a meat-centric diet. Along the way we’ve discovered that vegetarian and even vegan offerings can be outrageously delicious. We eat portobello mushroom burgers and “sushi” rolls made with avocado and cucumber not because they’re vegetarian, but because they’re awesome. Over the coming years we’ll continue to seek out more of these foods, but this time for a completely new reason: because it’s the right thing to do. Pastas are always an easy meatless option (I’m thinking Penne alla Vodka or Arrbabiata – one of which I’ll have tonight). Indian vegetable curries are very good too. thx — what to put on sandwiches when one does not like cheese? Falafel is pretty awesome. I’ve never tried to make it myself, but am thinking I need to give it a try. Very well said. We all should eat a lot less meat – it’s not good for us and the world cannot sustain the energy requirements of raising it. First of all, thank you for an excellent post. Many of your words here echo feelings and thoughts I’ve had over the past several years. Having grown up in a rural part of Louisiana, I was a bit of an outcast in many circles because I refused to hunt animals. My brother and father took me hunting one single time. When my brother shot and killed a rabbit, I screamed and cried until they gave up and took me home. That was the end of that. I think that what you’re saying is correct when you talk about meat being a “thing” and not an animal. Last year, I was on a road trip with a friend and we found ourselves at a McDonalds in a rural midwestern town. It was cold in the restaurant, so we sat outside. Parked 50 feet away was a cow transport truck. As I sat and ate, I began to feel this huge sense of guilt. We joked about it awkwardly, but I never forgot it. While I’m still a meat-eater, I do try to control the amount I eat and definitely do not waste it. I’m not a religious person, so I don’t say “grace” before I eat. I do, however, give reverence to the animal that lays before me. I’ve started moving toward more vegetarian dishes that are honestly better-tasting as well. Thank you so much for posting this. I apologize for the long comment, but you put a great deal of my thoughts and feelings into words. Long comments are good comments. Thanks for sharing your thoughts! Couldn’t agree more. I’ve had the same experiences–right down to the fishing. I was raised fishing and then one day I just couldn’t do it. I think it was a few things, including having children and the slow seeping in of knowledge–a story here, a documentary there–about anything from the meat industry to bull fights. I started to see the animals we eat much differently. Well, some of the best foods I have eaten are from deer I killed, pheasant I shot out of the sky and fish I have caught. Meat eaters who disdain hunting and fishing ARE hypocrites. No one needs to eat meat. Not all hunters mount animal carcasses and heads. It is not anything I have done, but I have no problem with it. And, there is nothing wrong in taking pleasure in hunting and killing of game. You seem to make stalking seem as if it is a bad thing. It is only one technique that is used. You do not like it that a person takes pleasure in the killing of the animal hunted or fish caught. You only take pleasure in savoring that filet mignon that someone else killed. The only real wrong is the killing of game and not using the entire animal. The other wrong is saying that you have not written in judgement of anyone; but you have, of “sportsmen.” Hunters do have feelings and do contemplate their kill when looking into the eyes of the animal and while holding its heart in their hands. I no longer hunt, but I do remember the feelings I had on my first animal and my last animal. The means of the kill do matter as you say, but the slaughterhouse is cold and uncaring where the hunter is not – far from it. I would say most hunters have more respect for animals than any anti-hunting buyer of cellophane-wrapped meat does. But then, I am not judging anyone, just stating my opinion. Plenty here I’d like to respond to, but mostly I’m curious as to how you draw objective boundaries. I’m wondering, for example, whether you’d offer the same defense in favor of someone who spent his weekends killing dogs; who “looked in to their eyes” before snuffing out their lives and “held their hearts in his hands” afterwards; and then justified his leisure activity by “using the entire animal.” If you wouldn’t defend that guy’s “sport,” might I ask why not? First, dogs vs. deer is not a good comparison. In those countries where dogs are eaten, dogs aren’t hunted. The killing of a dog is more like the killing of a barnyard animal. Let’s forget the slaughterhouses. I think farmers that kill their own animals have some appreciation for the animals they kill, be it cow, sheep, chicken, or dog. So, yes, I can differentiate between hunting deer or fishing versus killing barnyard animals for food, If I lived in a society where dogs were killed for food, I would accept that fact. But, I don’t live there. Now, where is that “objective boundary?” Good question. It’s more subjective than objective. And for me that boundary differs between bird hunting, fishing, deer hunting and game hunting of African wildlife. I wasn’t raised in a hunting family or fishing family. I was a city-slicker. I never hunted until introduced to it in my mid twenties. .Granted, I didn’t see anything basically wrong with hunting; otherwise, I might not have got started in it. I didn’t know if I could shoot a deer when I began. I did, however. It made me appreciate the hunt and the deer. Boundaries are fuzzy. I hunted deer, would have hunted wild boar, hunted pheasant and fished. I would have hunted elk and moose and ram if I could have afforded to go on those kinds of hunts. I would not hunt any exotic animal or hunt hunting-preserve animals as can be found in Texas, for example, nor go for trophy animals. These are my subjective/objective limits. To each, their own. I think part of the problem of calling hunting “sport” is part of the problem. Hunters are called sportsmen and there is sport-fishing. Hunting and fishing are not sports such as baseball or basketball. They are not games. Still, sportsmanship, in its definition of fairness, the following of rules and good behavior do apply. The taking of a life, any life, is dependent on ones morals. Is stomping on a cockroach or killing rats or swatting mosquitoes any different than killing a fish or cow or snake or deer? I am not sure If I answered your questions or not, I hope I gave you some insight into how I feel and where I am coming from. Thanks for your comments Ray, and yes, you did answer my question. I don’t think the issue, though, is one of terminology – whether we call it “sport” or something else it is hard to get around the fact that this is something people do for the fun of it. That changes things in my view. It’s not so much about what is being killed (a deer or a rat or something else) as the joy that is being derived from killing that is disturbing – to me at least. And while we might not think twice about setting out a rat trap, we’d probably still think the guy who spent his spare time searching for and killing rats for fun, took photos of himself smiling brightly over their dead bodies, and then kept the carcasses as trophies was just a little bit tweaked. A final word from my end. To me the joy isn’t in the killing itself, but in the satisfaction that I killed the animal I hunted and made a clean kill. It’s a fine line. As far as mounting a head or taking photos of myself with the animal I just killed, it is more for reminiscing than anything else. At least that is the way it is for me. I think some people do it just for the killing; I don’t like that. I feel there will always be fuzziness in that line between killing an animal, buying meat someone else killed and eating. There will always be some fuzziness in that line in how someone is to behave after killing something. What’s acceptable for one person isn’t for others. I have thought about what you wrote in your post and it is a good thing to periodically rethink the entire issue and even be questioned on it. Thanks. Reevaluating ones beliefs is always a good thing. And that holds equally true from this side. I can certainly see how hunting and its practitioners exist on a continuum. On one end might be ancient Native American tribesman (or at least how I imagine them) who hunted out of necessity and for whom the animals held a sacred place in their religion so they never killed lightly or indiscriminately. On the other end are a bunch of thoughtless yahoos with guns. We might legitimately argue about where the balance of today’s hunters sit on that continuum, but it is important for my side of the argument to recognize that that range of possibilities exists. I can also see that if a deer killed cleanly in the wild displaces an equivalent amount of industrially produced chicken meat then the hunter has, on balance, eliminated a fair amount of suffering from the world. And I also recognize that if all of us were forced to hunt for our meat we’d probably eat a great deal less of it. Of course we can skip that intermediate step and simply reduce our consumption, which is the direction we talk about in the post. Thanks again for you comments. I always enjoy thoughtful discussions like this. As I have gotten involved in the local food movement here in West Virginia I have visited farms and ranches and learned so much about the kind of food that is available in our supermarkets. I have been very active helping as much as possible with a new local food market (indoor/year-round) in our town and believe that we are very fortunate to have many farmers who care deeply about the care and quality of life for their animals. unfortunately, staying on a veg diet for more than 3 days makes me sick 😦 I have to meat my meaty needs regularly! But completely agree about the yumminess of veg and vegan food. Some of the dishes are out of this world! I love your point about the designation of ‘pets’ vs. ‘food’! It’s always been weird to me that Americans seem to eat beef, pork, and rabbit with abandon, but are grossed out by dog, horse, or guinea pig (all of which are common foods in other parts of the world). Discriminating based on the way the animal was killed (and treated prior to death) seems a lot more reasonable… Thanks for another great post! And rabbits occupy a curious place in American culture as both food and pets. Many years ago when the movie “Watership Down” came out, our local butcher put up a sign saying “You’ve read the book, you’ve seen the movie, now eat the characters”. Not everyone appreciated his sense of humour. Eggplant parmesan is delicious, and stuffing bits of cooked chicken in it doesn’t add to the flavor or nutritional value. In fact, speaking of chicken in particular (and hamburger), it’s pretty bland unless you add seasonings, dressings, toppings, etc. Whereas most fruits and vegetables, if ripened fully, are tasty all by themselves. I grew up on a farm here in NSW and every week my father would kill a sheep that we would then eat for that next week. We’d all help with the job and every bit of the sheep was used, what we couldn’t eat the dogs or chooks could and the skin was sold as well. When I left home and moved to Sydney I stopped eating meat because it just didn’t appeal to me sitting there in the supermarket on black plastic trays wrapped in cling wrap. I had no idea where it came from or what it went through to get there. It’s the factory farming that I have a problem with but I still eat a bit of chicken if it’s free range. I don’t like to eat fish because most of the ones I can buy here are farmed and full of antibiotics. Lol the rabbits – I think we’re one of the only countries in the world that eat our national icons – kangaroos and emus. Thanks, what an excellent post. My feelings are almost exactly the opposite. I’ve been (almost) vegetarian for a big part of my life, but throughout that period I have been happy to occasionally kill fish for food or eat game that I know had been wild shot. My objections to eating meat mostly come down to the practices in mass meat production. Last week I saw a dead marlin, the giant fish was brought to the marina after it died during the fight. I totally condemn this sort of fishing for pleasure, not food, but I was staggered by the response of the local community. There was uproar. I wonder if the people causing the fuss take their children fishing or stop to think where their tin of tuna came from? After all, my town runs on tourism, numerous fishing boats go out every day, including game boats. Just because this animal died, rather than suffering while some fisherman gets his jollies, they suddenly reacted.. I was rather shocked. and disgusted at the double standard. We have many wonderful meatless recipes. I try to follow a Mediterannean diet, but have only gone part-vegan. Saw Bambi at a young age and that was it for me, I eat veggies. I feel exactly the same way! I stopped eating meat last June and I feel great! I love animals and couldn’t live with the fact how animals have to live and how they have to die just that we can eat meat. And yes, it shouldn’t make a difference if an animal is a dog, a cat, a cow, or a pig. They all live and feel! I have to admit I’m one of those meat eaters who would not partiularly like to kill an animal myself. I don’t like seeing them suffer. But believe me, if I had to, I would kill to eat meat every day. This is not only because I love it, but because I am allergic to so many other foods (because of my Lyme-disease-damaged immune system) that I could not possibly achieve adequate nutrition without including meat. Like you, I am surprised at people’s distinctions between animals it is OK to eat and ones it is not OK to eat! I have even met people who told me they were vegetarians and then mentioned that they eat fish. In other words, they are NOT vegetarians! This was a very good post!! The way I see hunting is that there are two types: sport and real hunting. I’ve never hunted in my life, but I would like to one day, not for sport, but to be able to feel like I can sustain myself by not only growing fruits and vegetables, but to also bring home meat. Our society no longer needs either of those things, but it’s this ability to survive that I want to keep honed just because that is who we, as humans, should be. As for the differences between hunting and farming, there are so many factory farms out there that force animals to endure what I would consider torture, that hunting a wild animal seems so much more… humane. The animal lived its life and ended its life in the place it was meant to live – not in a tiny cubicle in a barn where it never sees the light of day. At the same time, I am well aware that many farms are not like that, and I have no issue with them at all. I do, after all, spend more than enough time at a barn that has horses. But you are absolutely correct in that we get offended over the killing of animals that we have a fondness for. We should all be aware about cruelty when our food is conserned. I still eat fish, and I fish. But I fish only the fish I am going to eat. And I eat mostly wild animal meat, that is animals that had a natural life unntil the last minute..From populations that are not endangered of course.